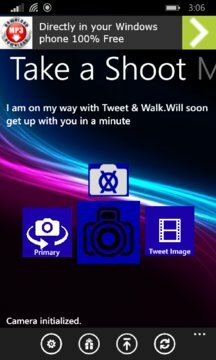 You can now easily type tweets and take and upload images and send messages while walking to your destination without messing up with traffic on road or street! Tweet & Walk it's a unique app that enables you to experience an innovative concept where a high resolution camera is capturing the ambiance and happenings surrounding you while you are on your way and simultaneously wish to use your mobile device for tweeting! 1.Design with user-friendly and elegant interface! 3.Camera View Y/N – Camera can be switched off in case you are stationed and still want to use the app itself only. 4.Capture Image and Share on Twitter – You can snap photos and share it through Twitter where in addition, you can also share tweets on this platform. 5.Character Count - This feature allows you to see the length of your tweet before sending it. 6.Enables you to Walk & Tweet one big twitter text to multiple tweets and post Tweets in a much more fun and easy way. 7.See your popular favstar.fm tweets on your favstar profile. 8.See your most recent tweets on time.mk including interactions with other people. 9.Different backgrounds for Light and Dark Theme. 11.Advanced Settings for customizing your Live tile size, appearance and design. 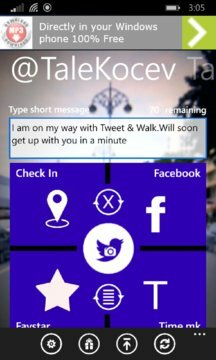 Tweet & Walk without doubt gives the most complete Twitter experience for Windows Phone when walking and goes beyond that just a simple Twitter client posting app.